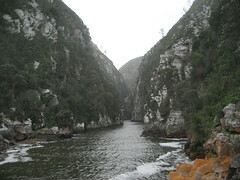 South Africa has some of the oldest earth on earth. Accordingly, it has some astonishing mineral reserves. Since they started digging for it, it has been one (if not the) leading source of gold, platinum, diamonds (and much else). This simple fact has altered a country, a race, the continent and the world for generations. It is why South Africa has developed (and struggled) leaps and bounds beyond any other sub-saharan African country, and has since the late 1800s. Today, the 18% of that countries economy that mining fuels keeps the country vibrant and growing even when the rest of the world economy struggles. The simple fact that diamonds are an integral part of todays wedding ceremonies has much more to do with a guy named Cecil Rhodes than a naturally occurring stone. It's not only mineral riches, it's also marketing genius. Diamonds are undeniably beautiful, but they aren't the rarest gem nor are they the hardest material. They are an essential part of todays engagement and marriage rituals not because of something inherent, but because of a marketing campaign from the 1930s. 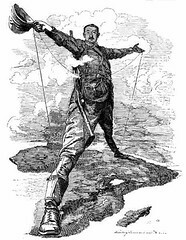 But the story starts well before that, with Cecil Rhodes a colonial leader of a huge swathes of southern Africa. He got his start in South Africa, and ultimately bought out the De Beers family farm and used that to secure the majority control of the worlds diamond output. He was able to pull off this coup because his domain had the vast majority of the worlds diamonds. He found that by carefully controlling the worlds supply he could set the price for a diamond to whatever he wanted. After his death, the De Beers diamond company had a near worldwide monopoly of a gemstone that the world cared less and less about (in 1932 worldwide diamond sales were about $100,000.) So, one day in the 1930s, they hired a firm called NW Ayers in the US to see what could be done. They tried to rescue a fading concept, the 'diamond engagement ring' through clever product placement. By 1979 the the worldwide diamond market was worth $2.1 Billion. Specifics are difficult to find, but in 2005 the worlds output of diamonds were worth $13.4 Billion. More than 80% of American engagement rings have a diamond, at an average cost of about $3,200. That campaign has had an unbelievable impact well beyond convincing people what stone engaged women need to wear. It changed the economy and power base of sub saharan-Africa. I won't exaggerate a point, but there is a reason people call them blood diamonds. They've literally held up apartheid regimes, finance civil wars, and make a lot of beautiful people glitter. That's only one part of what has become an astonishingly lucrative industry. What I now like to call, 'the Wedding-Industrial-Complex' has taken DeBeers lead and used clever marketing to convince people that an average American couple needs to spend an average of over $26,000 on a single day. There is nothing wrong with that, and I'm grateful that I've been invited to some truly remarkable weddings. At the end of the day, it's a couples decision and whatever it becomes should be considered a generous gift to the friends and family that they invite. But, when Erin and I talk about it, we found that even if we could afford it, it doesn't fit with our quirky priorities. We can think of other things we'd prefer to spend that kind of money on. That could be a year-long international adventure travel honeymoon, clean drinking water for about a thousand people that don't have it, or sending 650 poor kids to the schools Erin is developing for a year. It's right about here that this whole story collapses into something a lot more personal. People have every right to have any wedding they want, and I've long known that I'm peculiar because many of my priorities don't align with much of the society I grew up in. What I find remarkable is, I've been fortunate enough to meet another person who shares my peculiar perspective. I love Erin, and have gotten to a point where I can't really imagine my life without her. I wanted to ask her to marry me, but was stuck. I don't want to be that guy so obsessed by history, politics and being manipulated by marketing that I can't let true emotions show. Unfortunately, I didn't know if I had it in me to buy a diamond. 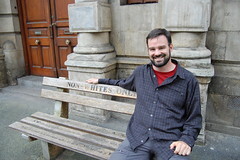 I asked Erin to marry me in Antananarivo, Madagascar. I'd been thinking about it for a long time, but it wasn't until we were lost in a conversation about how we both wanted to live an 'exceptional life' that I realized that I didn't need or want to wait any more. The next morning, we got up early and went shopping for rings in the jewelry district. I started the day by asking her to choose any ring she wanted, quite literally, and without any caveats. We looked at thousands of rings. Most of them, obviously, were diamonds. For her engagement ring, Erin chose an Emerald.